Attendees from which countries you are more likely to meet in Lisbon? 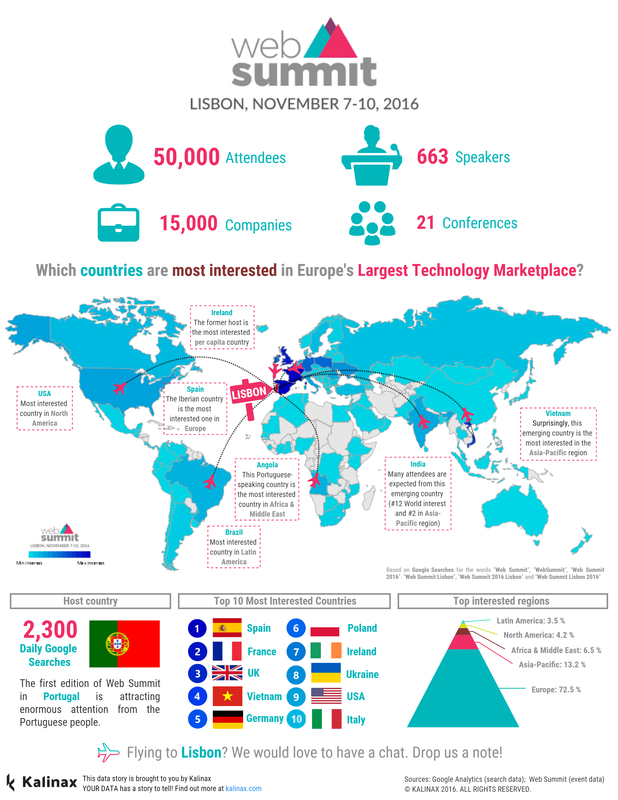 With exceptional interest from major European countries, global emerging powers and Lusophone Africa, this year's Web Summit promises to be a not-to-miss for your business. Europe generates the most interest in the event globally, originating 5.48 times more Google searches than APAC which remains second. In addition, 8 of the top 10 countries of origin of interest in the event are located on the Old Continent. 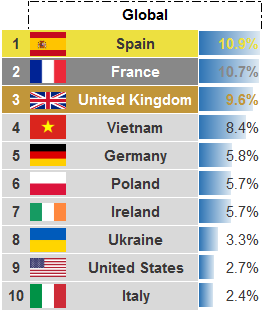 Spain, France and the UK being the top 3. 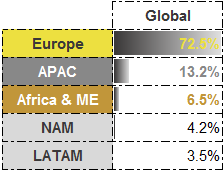 Germany, Poland, Ukraine and Italy - these are the other 4 European countries where the interest in WS trends high. Are you at the Summit? or search "Kalinax" in your WebSummit app to directly arrange a catch-up with our representative. Results expressed in Daily Google Searches per million of the population. The former WebSummit host is far from being disengaged with the event. Ireland tops our per capita interest chart. Close in second is the small island nation of Cape Verde which you should be aware enjoys a special relationship with the EU. European small nations - Luxembourg and Malta rank third and fourth, so expect to see a good number of businesses from there. It seems like the Web Summit does appeal to island nations, with the Seychelles and Iceland coming 6th and 7th in our interest in the WebSummit per capita world ranking. And how about the rest of the world? ​You can expect to make a good number of US American, Canadian and Indian business connections. Other key countries you can count on being represented are Malaysia, Israel, South Africa and the United Arab Emirates. Vietnamese contacts according to our sources will be difficult to encounter, despite the overwhelming interest Vietnam showed in the event. "Being the only Portuguese-speaking people in Latin America, and also enjoying close political and business links with Portugal, count on Brazilians being present this year. 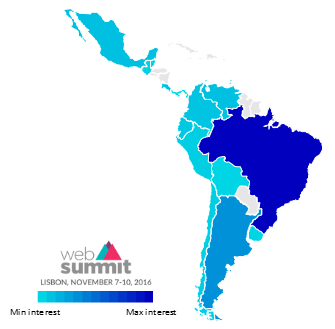 There's never been a better time to make some key connections in LATAM", highlights Pedro Pereira who is in charge of our WebSummit coverage. Argentina, Costa Rica and Mexico are the other Latin American countries which you have a good chance seeing on more than a few badges this year. As noted, the Middle East will be well-represented in Lisbon with UAE and Israel accounting for a good number of expected attendees. 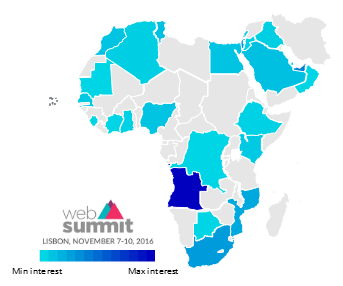 Our research also points out to the unprecedented interest in the WebSummit from Portuguese-speaking Africa, namely Angola, Mozambique and Cape Verde (a.k.a. Cabo Verde). Excellent opportunity to reach out to the intriguing attendees and speakers from these countries, and grow in this vibrant region.